In Part 1 we took at look at the architecture of the Quest Free/Busy (F/B) Connector in Coexistence Manager for Notes (CMN) as well as how Exchange interfaces with it. We also configured the F/B Connector web services and the Domino Free Busy Connector Service. In Part 2, we configured the Exchange Free Busy Connector Service, the Domino QCALCON task, and the Exchange organization. In this post, we’ll complete the configuration by configuring Lotus Notes as well as building a test user in Exchange and Lotus Notes to validate the configuration. At the end of this post you should have working Free/Busy coexistence between Exchange and Notes. All of the configuration tasks in this section will be performed in the Domino Administrator tool. Browse to Configuration > Messaging > Domains. Select Add Domain on the toolbar. Gateway mail file name: mail.box. At this point, Domino should begin routing Exchange calendar requests to the QCALCON task and over to Exchange. To test this, we’ll need to configure a couple test users. We’ll create two test users for this exercise. 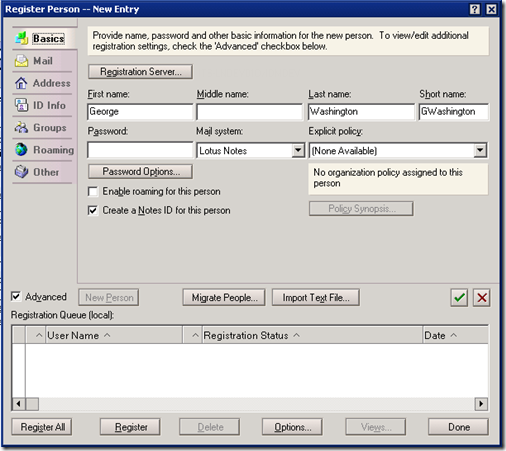 User George Washington will have mail on Lotus Notes, while user Abraham Lincoln will have mail on Exchange. First, let’s configure Exchange. Create a Contact in Exchange for George Washington. Specify an External Email Address (targetAddress) of gwashington@lotus.contoso.com. Create a Mailbox in Exchange for Abraham Lincoln. Ensure the primary email address for Abraham Lincoln is alincoln@contoso.com. In step 1, we’ve created an object which will be used for routing mail as well as for ensuring that the availability service redirects free/busy information to the Quest components. Next, let’s add these users to Lotus Notes. Switch to the People & Groups tab in Domino Administrator. Browse to Domino Directories > CONTOSO’s Directory > People. Next, we need to register George Washington with Notes. In People & Groups, expand People on the right under Tools, and click Register…. Populate the Basics tab as shown. Be sure to select LN-SRV01 by clicking Registration Server…. Switch to the Address tab. Press F9 to refresh the People view. What we’ve done is created a Person document for Abraham Lincoln which forward to Exchange and specifies the Foreign Domain created earlier for calendaring. 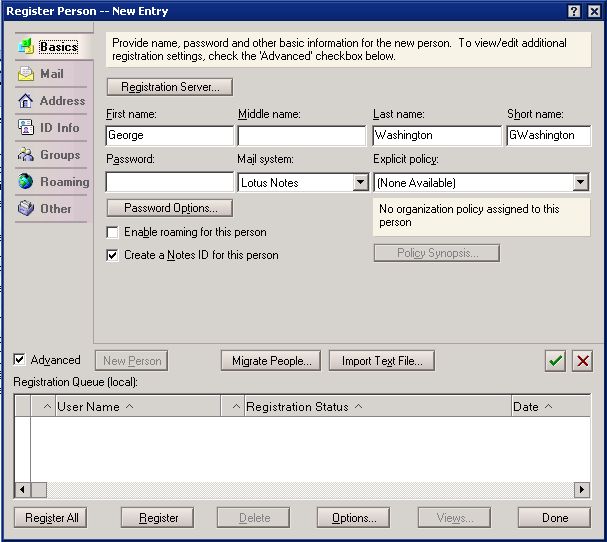 We’ve also created a full fledged mailbox enabled user for George Washington in Lotus Notes. Populate Abraham Lincoln’s calendar with a few appointments in Exchange. In Lotus Notes, populate George Washington’s calendar with a few appointments as well. Open George Washington’s person document from the People view in the NAB. Click Open Mail File… on the toolbar. Click Mail and then Switch to Calendar in the upper left of George Washington’s mail file to open the calendar. In Exchange, invite George Washington to a meeting using Outlook. Verify the free/busy information is displayed (e.g. no hash marks). In Lotus Notes, invite Abraham Lincoln to a meeting. verify that the Find Available Times tab shows free/busy information. Be advised that in both cases it may take a few moments for data to become available. QCALCON (Domino to Exchange lookups) – c:\lotus\domino\qcalcon.exe.log. 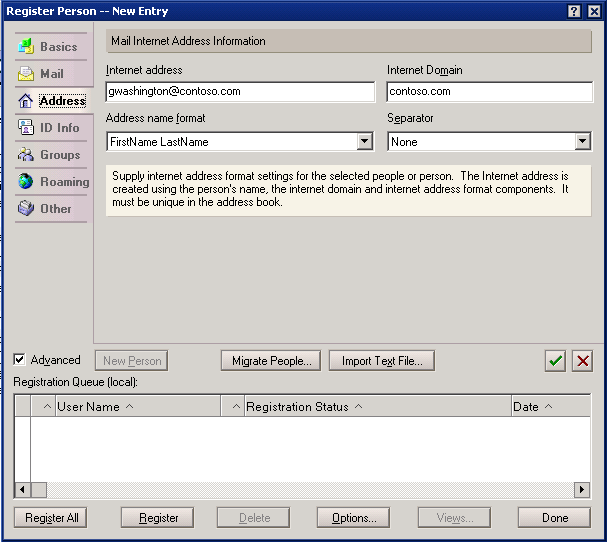 Exchange Free/Busy Connector Service (Domino to Exchange lookups) – C:\Program Files (x86)\Quest Software\Quest Coexistence Manager for Notes\Free Busy Connector\ExchangeFreeBusyService.exe.log. 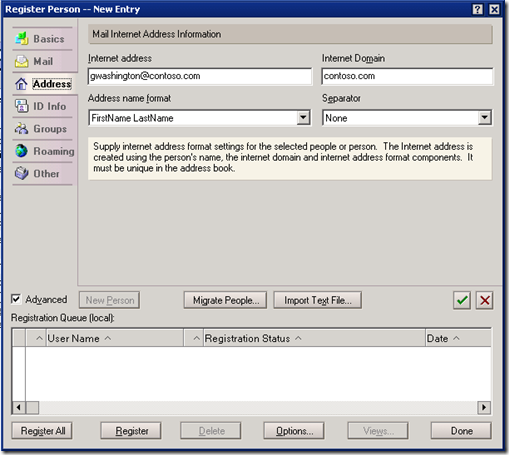 Domino Free/Busy Connector Service (Exchange to Domino lookups) – C:\Program Files (x86)\Quest Software\Quest Coexistence Manager for Notes\Free Busy Connector\DominoFreeBusyService.exe.log. One additional useful tip surrounding the Quest components deals with caching. Both components keep requests cached in memory for 5 minutes by default. When you're troubleshooting, this can be problematic as you must restart the service each time you change a user in Notes or Exchange to see the effect. You can go in the Advanced configuration of either service in PowerGUI and tweak the cache lifetimes to "0" to disable caching. Just be sure to return the cache to the default values once you put the environment in production. The Outlook availability service logging is also quite useful. You can enable that by going to Options>Advanced>Other>Enable Troubleshooting Logging. Restart Outlook and create a new meeting request. You’ll find logging information in %temp%\olkas which will include the exact errors and XML returned by the Quest components.